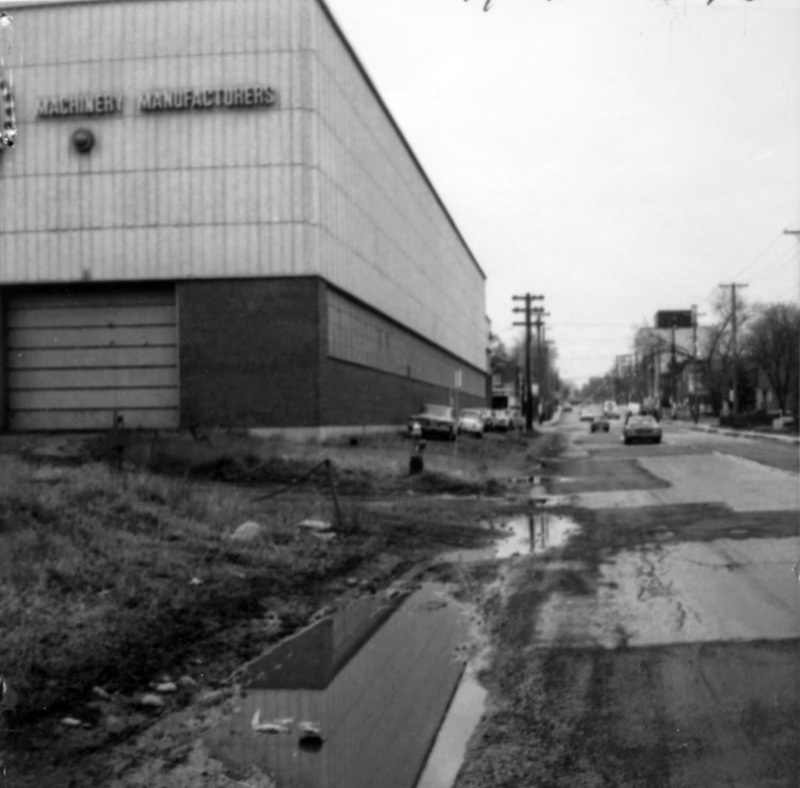 For 60 years, one of Canada's most recognizable companies, and producer of some of the finest appliances worldwide, existed in Hintonburg in what was then a small industrial area at the north end of Holland Avenue. A true landmark in west Ottawa, the Beach Foundry arrived in the area when all the pieces fell into place. The Foundry was already thriving, and land in our neighbourhood was plentiful and affordable. 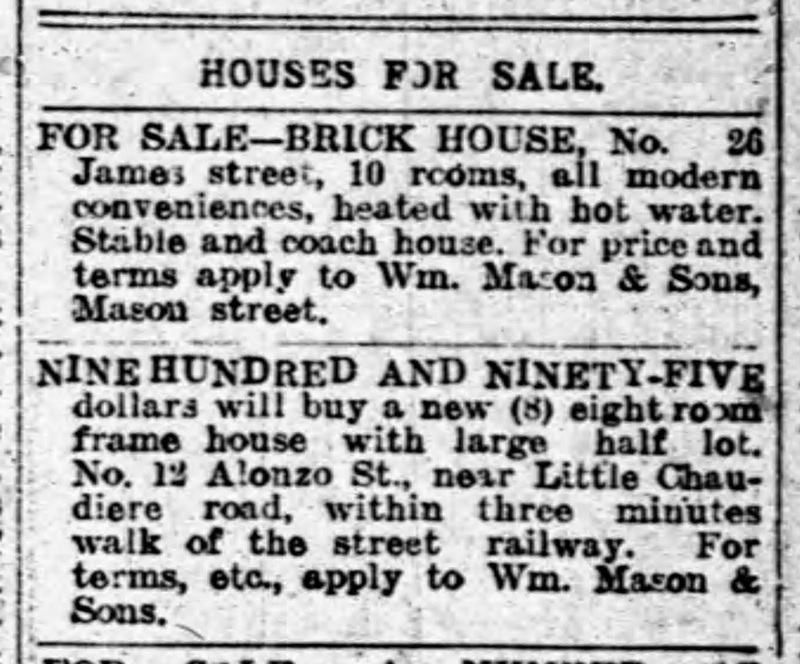 The Ottawa Land Association, after sitting on their land holdings for upwards of 25 years (they owned almost all of the land from Parkdale west to Western Avenue, from Carling to the River) were finally beginning to offer lots for sale. The Great War had just ended, and with it came an improved Canadian economy, with the commencement of the roaring 20s. Thus, it was a perfect marriage between the expanding Beach Foundry and Kitchissippi. 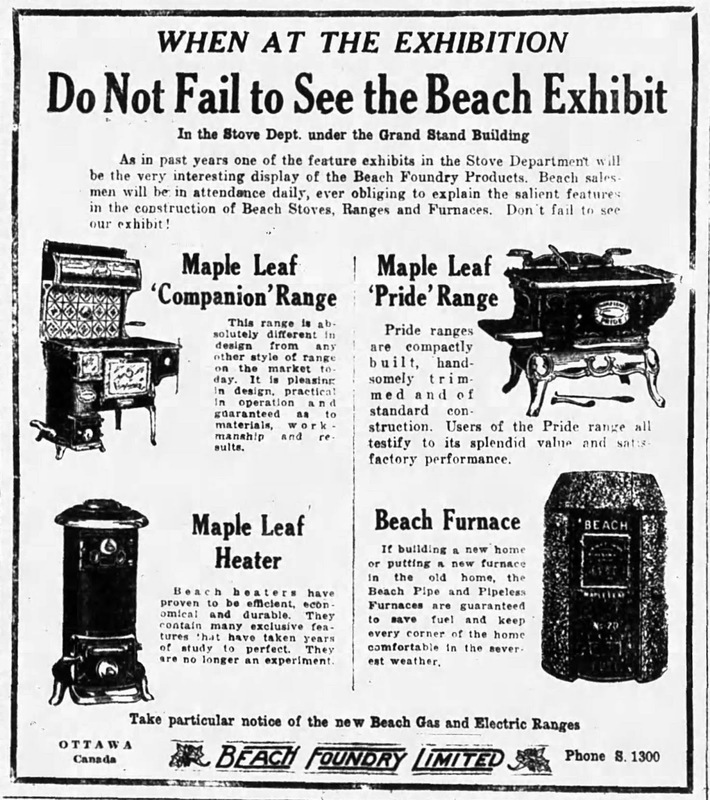 Beach Foundry actually began in 1894 when Benson C. Beach, in his native Winchester, Ontario decided he could design and manufacture a better and cheaper stove than any then being offered on the market. At the age of 24, with two assistants, he created patterns in wood and metal, and then using a small cupola (a small vertical cylindrical furnace used to melt iron) successfully produced the first Beach stove - a Longwood box stove. Within a short time, sales took off throughout eastern Ontario. The Beach stoves were both functional and decorative. In 1895 they began producing arguably their signature product, the Maple Leaf, "replete with fancy and intricate scrollwork, gleaming with its blacklead polish". For years, two stoves a week was the company's output. In 1902, the company continued their growth when they began producing steel ranges for coal and wood. The firm was provincially incorporated in 1903, and with their exploding popularity, Beach products were finding homes throughout Canada and the world. The company began to be considered a leader in home heating and cooking, and soon required a move to Ottawa to expand operations. 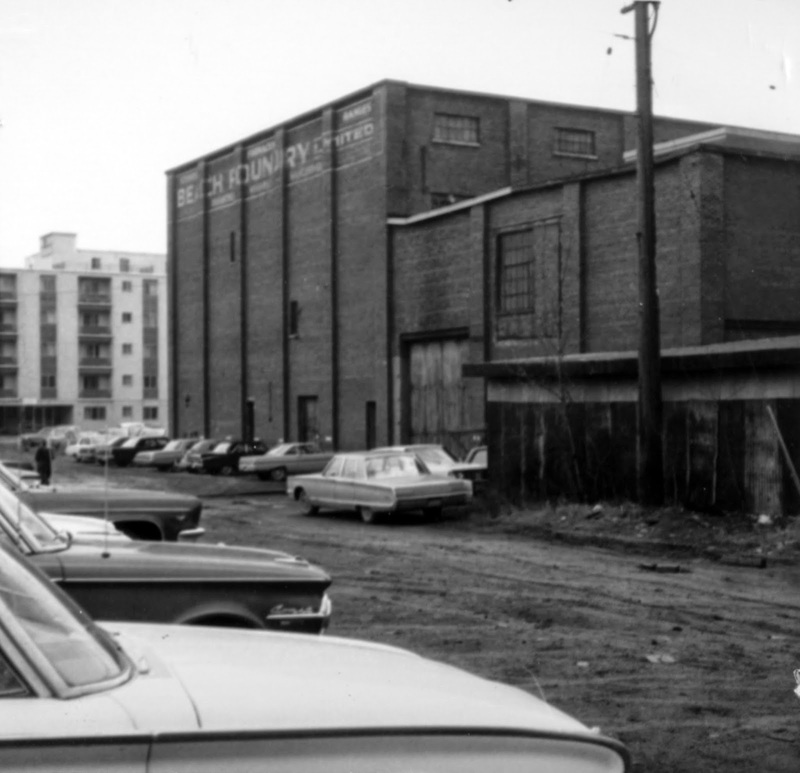 In 1914, they relocated to Broad Street, in an existing foundry building (the former Butterworth Foundry) in the heart of LeBreton Flats, allowing for an increase in production of 25 to 50 percent. They once again would outgrow their space, already realizing in 1917 that their plant was inadequate. But war conditions did not permit construction of a new plant, so for several years, the company was forced to produce less than their demand. 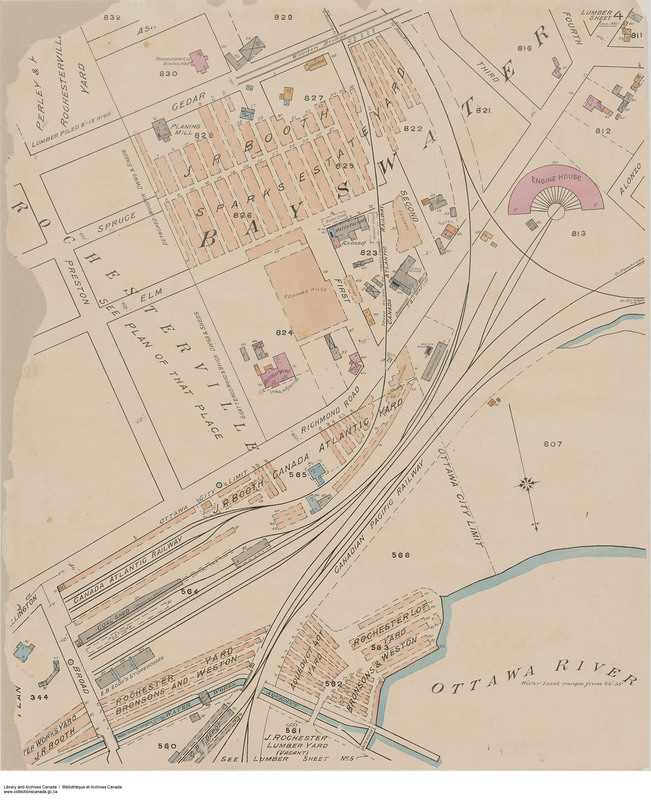 In early 1919, the Ottawa Land Association agreed to sell a large 4.5 acre portion of their vast property, which at the time was largely open space from Parkdale west, to the Beach Foundry Company. 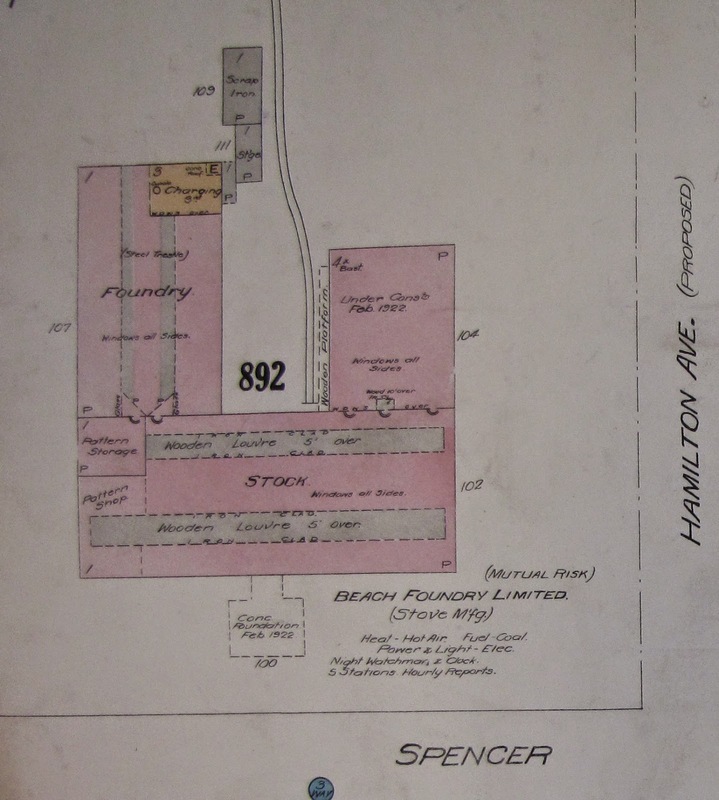 However, before the deal could be finalized, Beach hinged the deal on two requirements: firstly, that the City would agree to close Hinton Avenue between Bullman and Spencer Street; and secondly, that they could have a fixed (and relatively lenient) tax assessment for 10-years, to assist in their endeavour to build a large $75,000 plan on the property. The assessment proposal was supported by the Board of Control, however the idea to close Hinton was fought by several local businessmen and property owners. Contractor Thomas McLaughlin, who owned many lots on Hinton valued at $2,700 was the most adamant against the idea. "I'm looking for protection, because I think this is wrong. It looks like a steal, and I may have to go to the police court." he told the Board, "I couldn't build a hen house if you close the street.". The application to close Hinton went to County Court, where it was initially thrown out due to the fact that Beach legally could not apply for a change to the plan when he did not yet own the property. The Land Association had to re-file and eventually won out. 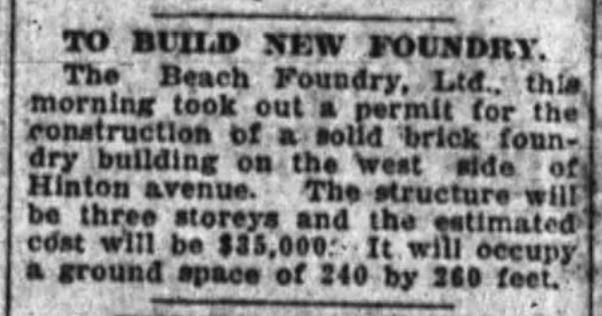 On June 22nd, 1920, Beach purchased the site officially from the OLA for $13,200. 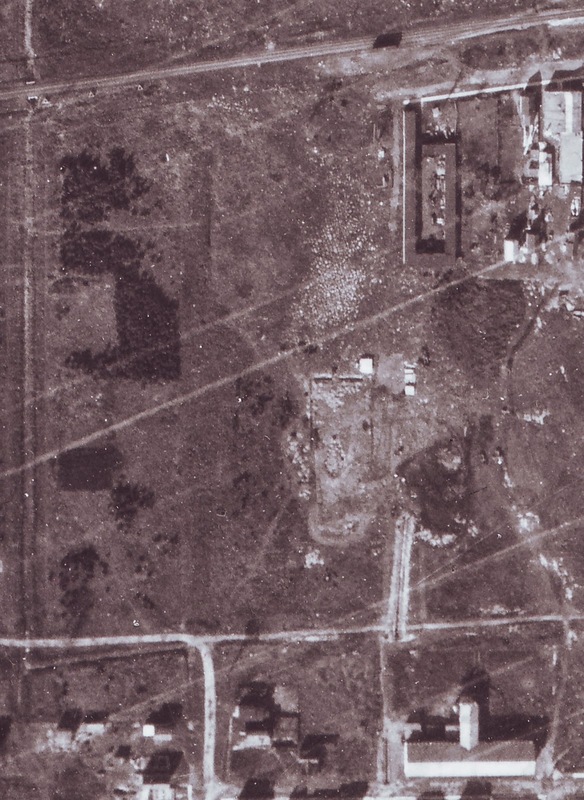 Immediately, work began on the foundation of the foundry, and thus when some of the first aerial photos ever taken of Ottawa were snapped in mid-1920, some evidence of early work can be seen on the site. seen at bottom right. Holland Ave goes no further than Spencer. The CPR tracks run left to right at the top where Scott now exists. Excavation for the foundry can be seen in the center of the photo. 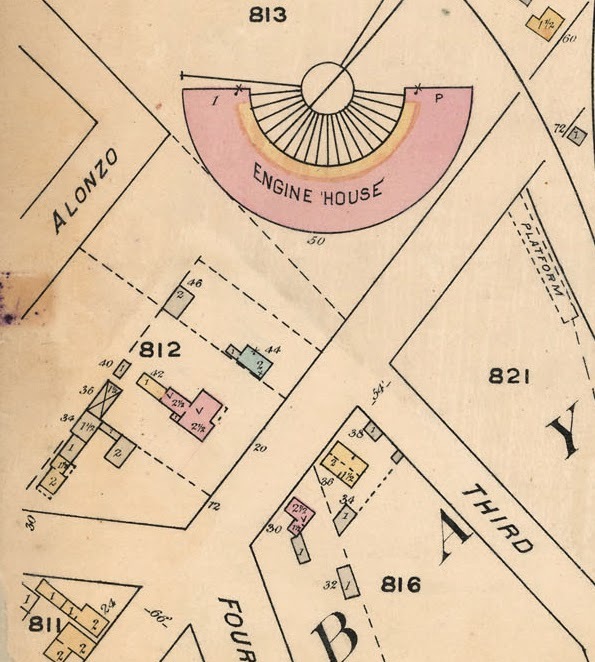 On February 2nd, 1921, a building permit was taken out for construction of the foundry building. In all, four buildings were initially built on the property: No. 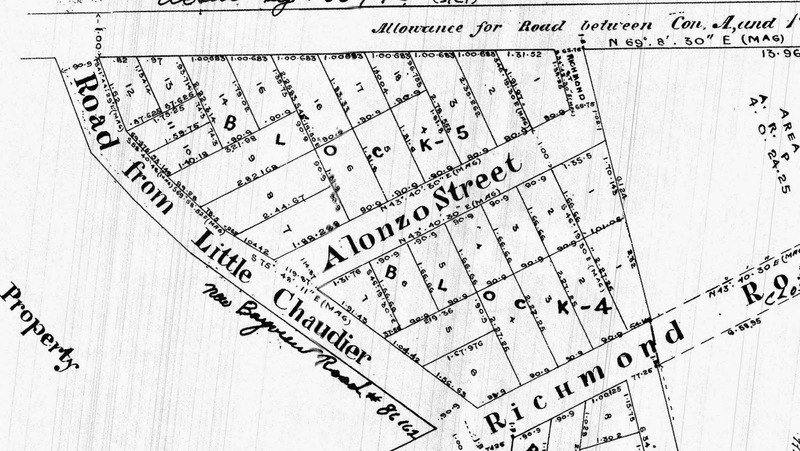 1 building (the foundry) was three-storeys and 240x260 feet; No. 2 building was the assembling plant, one-storey, 100x240 feet; No. 3 building was a four-storey structure, used for manufacturing and shipping with total floor space of 32,000 square feet; and the fourth building was a smaller office building two-storeys in height, 36x44 feet in size. By 1923, Beach was producing a complete line of stoves, ranges, heaters and furnaces, and the capacity of the new plant was at 150 stoves per day. 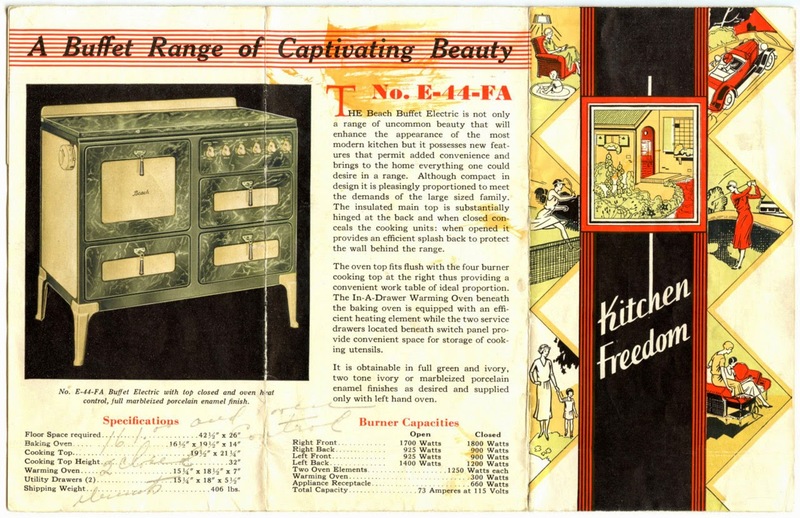 Innovation came about through the development of new gas and electric ranges in the 1920s. and domestic and commercial refrigerators and air conditioning equipment by the 1930s. 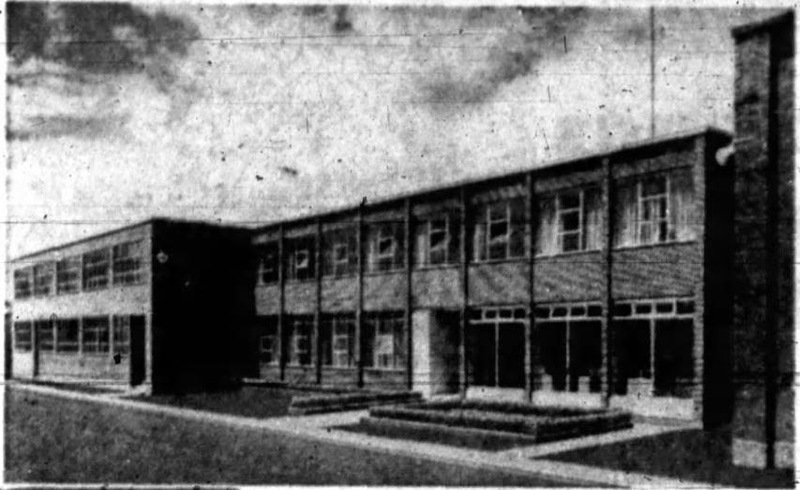 The plant continued to expand quickly throughout the 1920s, including a large $60,000 addition in 1927, so that by 1928, just 8 years after first arriving on site, the foundry had more than doubled in footprint. 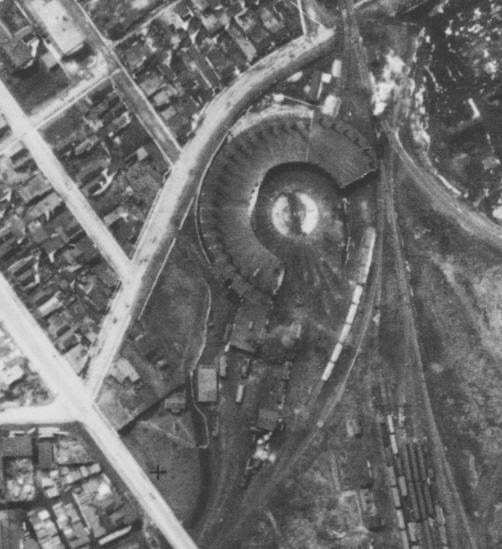 the 1920 aerial photograph above - quite a build-up in 8 years! In 1939, residents of Holland Avenue campaigned to Ottawa's Parks and Trees Committee for the creation of a "tree screen" along Holland Avenue to block the ugliness of the buildings, and also to serve a protective barrier against dust from the foundry. The request likely came as a result of a recent explosion and fire at the plant, which shot foundry dust into the air above Wellington Village. These trees may have been planted, but would not have lasted long, as the plan would be expanded substantially in the 50's. During WW2, the plant shifted priorities, and put on hold all appliance production to lend a hand to the war effort. The Beach Foundry produced steel tank track, shell plugs and other equipment. 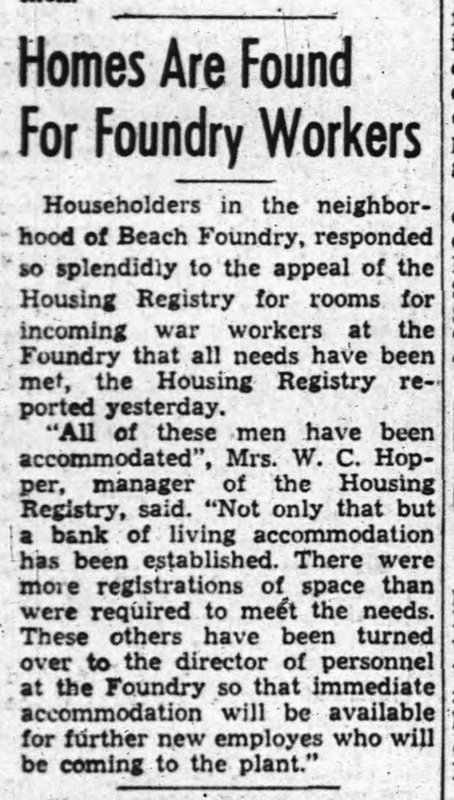 The number of employees at the plant actually increased, to the point where the government put out a call through the newspapers encouraging residents of the area with a spare bedroom to contact the Housing Registry through the war office, in order to find temporarily accommodations for the influx of workers at Beach. 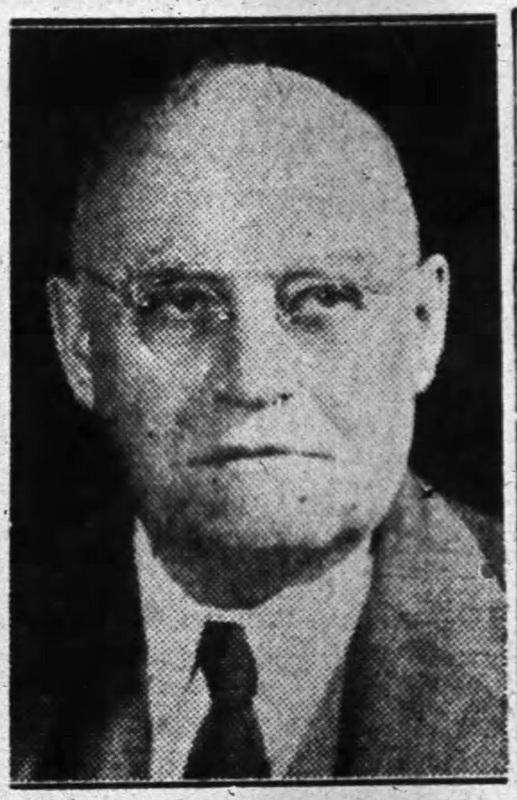 Benson C. Beach passed away on February 27th, 1949 at the age of 79, after a long, pioneering career at the helm of one of Ottawa's most successful businesses. Benson's son Donald J. Beach was appointed president in his place. Reports of incidents at the plant are numerous throughout the years. Fires, explosions and injuries occurred on a fairly frequent basis. This may not be too surprising, owing to the nature of the work being performed. In 1944 the enamel works section of the foundry was destroyed by an explosion and fire, causing $90,000 damage. 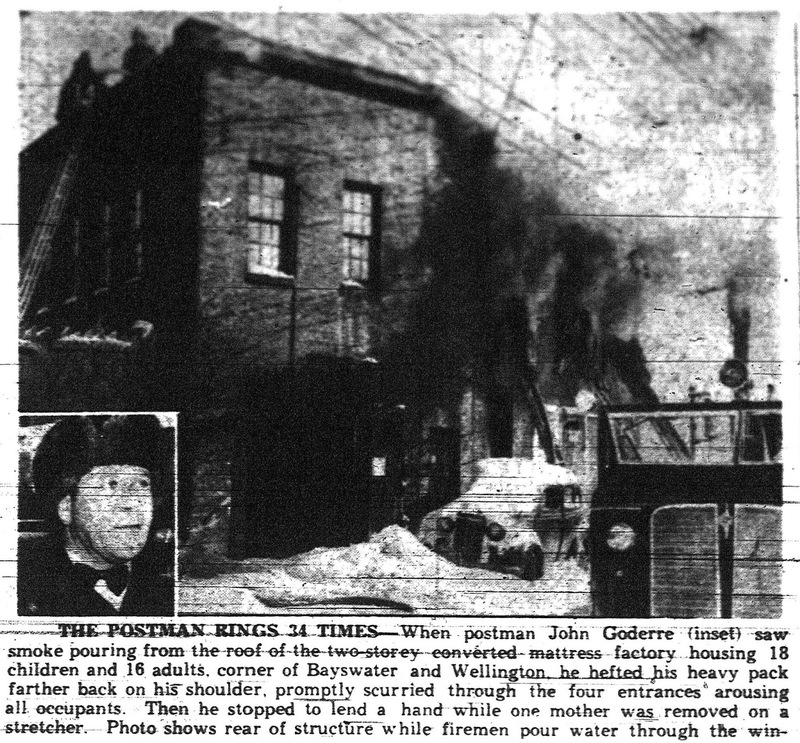 In July of 1948, a particularly bad explosion (of a pot of molten metal) blew out 200 windows and sent a cloud of dust material over the immediate neighbourhood. A large fire in July of 1954 caused $350,000 damage, and was caused by an explosion of tanks of paint thinning materials and gasoline. Hundreds from the neighbourhood spent their Canada Day evening watching the fire at Beach Foundry take out the top three floors of the paint, tin, assembly and storage division building. July 2, 1954 after a fire in the top floors in the tallest building. The intersection of Spencer and Hamilton, looking north. In 1955, a merger was announced between Beach Foundry and Alexander Fleck Ltd. Fleck had been involved in Canadian industry dating back to 1842. An article from 1956 noted that they were Ottawa's oldest industry. 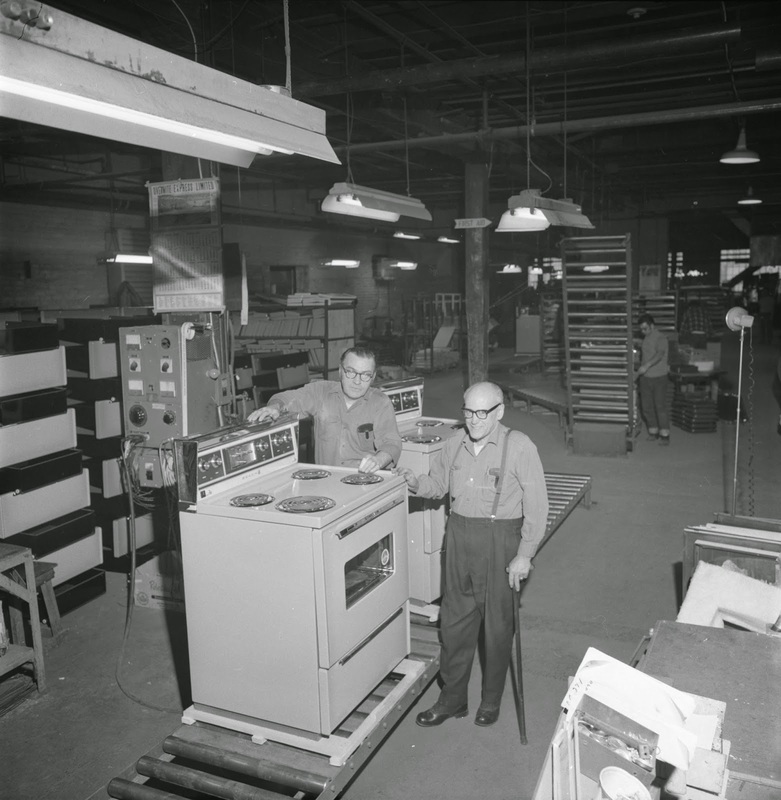 By the 50s, they were predominantly involved in the manufacturing of specialized pulp and paper equipment. 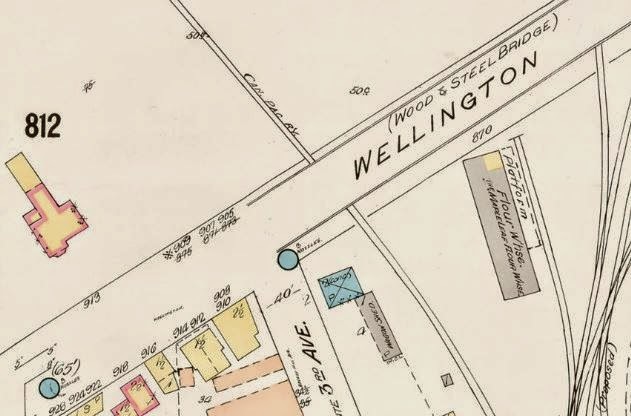 Their base property on Wellington Street was expropriated by the federal government, and they chose the Beach site as an opportunity to relocate within the City of Ottawa. Plans were immediately drawn up to construct three new buildings, including an additional Fleck plant and a new head office building with a demonstration showroom. F.E. 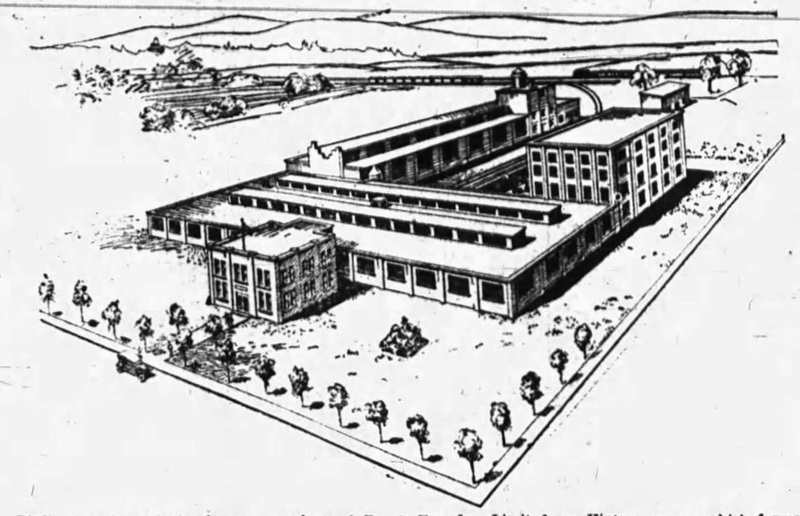 Cummings of Westboro won the contract to build the new plant at a cost of $900,000. The Fleck foundry building was built between at 42 feet by 305 feet, fronting on Spencer and running along the edge of Holland Avenue. The new office fronted on Spencer as well, a little to the east of the new foundry. Construction ran between 1956 and 1957. Mayor George Nelms cut the ribbon on the new plan on Tuesday July 9th, 1957. Two days later, on July 11th, a grand opening was held for the new showroom and head office of the Beach Foundry. The firm at this time was still employing over 300 men, and they proudly produced all products entirely within the plant (with the exception of sheet steel and a few purchased parts and accessories). I was fortunate to have a chance to speak with Paul Johanis, who he himself worked there for a couple of years in the 1970s (as did his father for 28 years from 1951 to 1979, eventually becoming foreman of the machine shop and manufacturing engineer). Paul was able to really bring to life these key years in the plant's life, so I appreciate his contribution of many of the details in the rest of this article. Paul noted that during this stage "the foundry part of the operation was very small...no more than 20 workers. They made small castings of various types, some used in the manufacturing plant (like the gas stove burner grates) and outside customers. Very traditional method, sand moulds, hand pouring and finishing. ", while the Fleck plant "manufactured very large metal parts like boilers and kettles for the paper industry, also made supports and parts for the radar dishes on the DEW line, custom one off type contracts. Very specialized machinery operators and such, not so much a local employer." "By far the biggest operation was the electric and gas range manufacturing", which he guessed employed 200+. 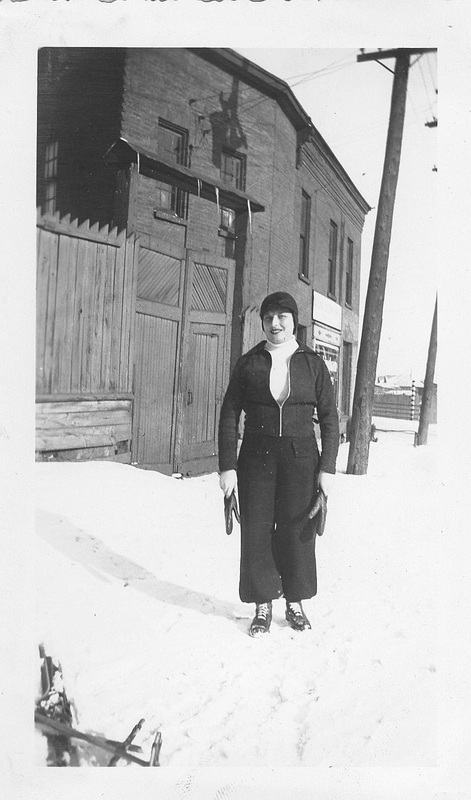 He noted that Beach was indeed an important source of employment for the neighbourhood, but that workers came from all over, including many from the Quebec side. background, Wellington well off in the distance. In January of 1968, Beach Foundry assumed full control of Alexander Fleck Ltd., and in 1969, the Fleck pulp and paper industry equipment business was sold to Hydraulic Machinery Co. Ltd. of Montreal. This created room for the mobile home furnace production line. 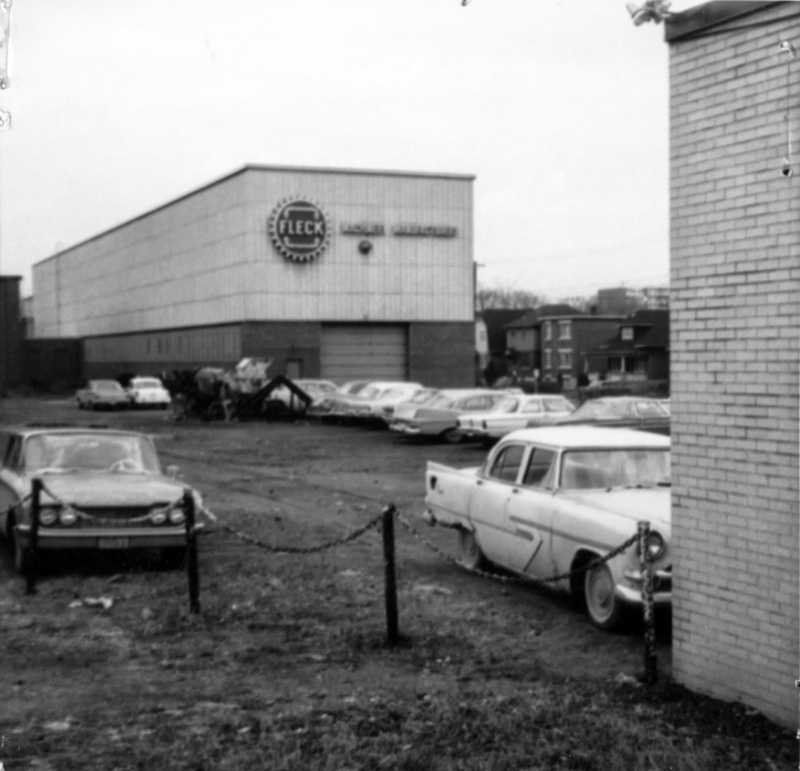 The foundry division was closed in October of 1970, making room for metal-forming and storage. Canadian Admiral bought in to Beach Foundry in 1971, when the firm was operating with 180,000 square feet of manufacturing space and 80,000 square feet of storage. Three assembly lines for ranges were in operation (one for deluxe double-oven gas and electric ranges, the other two for 24-inch and 30-inch ranges). According to an article from 1971, here were the steps in producing appliances at Beach: "raw steel is brought from the mills, sheared to size, formed into parts, porcelain enamelled, and then conveyed to the sub-assembly and assembly lines. Special parts, not manufactured by Beach, are purchased from other firms and incorporated in the product at the point of assembly." 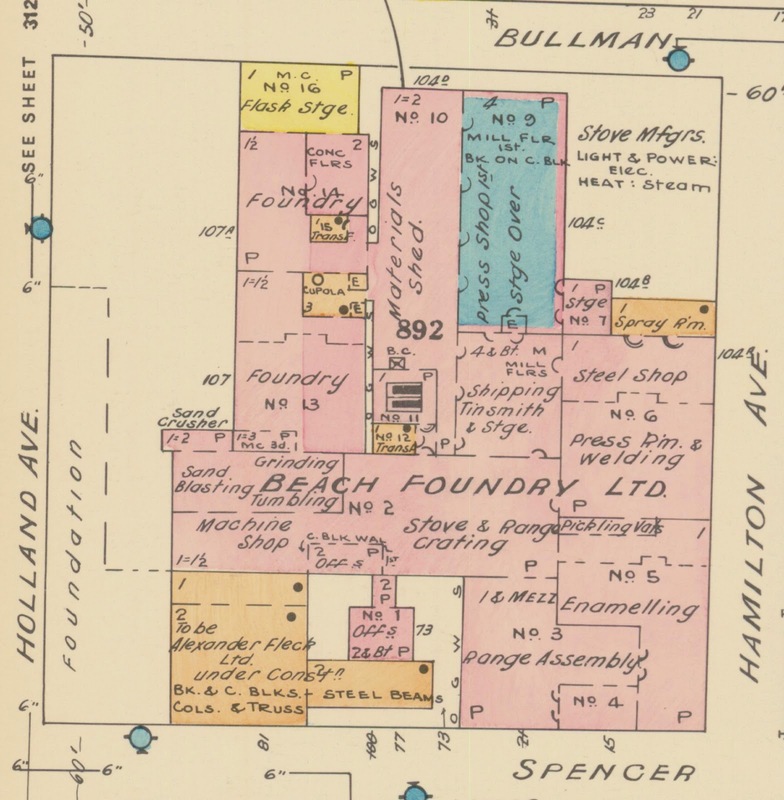 By 1971, Beach Foundry still was listed as employing 300 workers. The rail siding connecting to the CPR line on Scott (which is visible in the early insurance plans and aerial photos, and in the photo of the rear of the building just above from 1966) was still in use in the 1970s. Paul noted: "Yes, the siding was still there and being used when I was there. One of the jobs I had was in the shipping room. 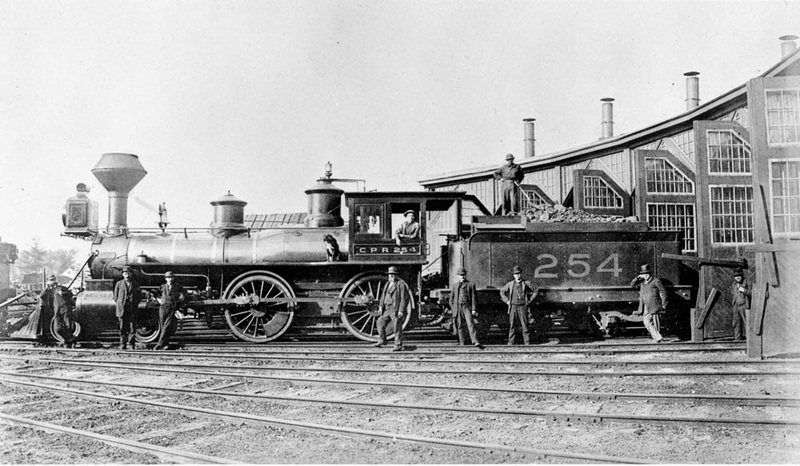 We would use hand carts to move stoves from the warehouse onto boxcars on the siding. There was a large door that opened at the back and the cars would be pushed through and up to a loading dock. We would stack to stoves inside. The diesel engine would come regularly to pull out cars and push new ones in. We also loaded up 18 wheel trailers from the loading dock on the Hamilton side of the building, near Bullman. The steel sheet used to manufacture the stoves would be shipped to the plant and unloaded back there as well." While digging deep in the City Archives recently, I came across this photo from the Andy Andrews collection, which was labelled "the last Beach range". The date of the photo was December 13th, 1971. I was surprised to hear that this may have meant that Beach ceased production of the appliance in 1971, particularly since some of my research indicated that kitchen stove/ovens was the only thing they were still producing by the late 70s. But Paul noted that production in the 70s was likely under contract; and that once the appliance was complete "we put Admiral and Baycrest (the Bay brand) nameplates on the stove. It's possible that the last range branded Beach was produced then". In 1973, Canadian Admiral was acquired by Rockwell International, and Beach Foundry became Beach Appliances International. From this point forward, the business was on shaky ground, as working conditions changed. Gone were the days of Beach feeling like a family. There was increased tension between senior management and the workers of the plant, and talk of plant closure and downsizing was prevalent seemingly for the entire decade. On Monday August 29th, 1977, the workers of the foundry staged a two-day walkout, to protest the five-day suspension of five employees who were executives in the union, who had taken the previous Friday off to discuss the upcoming contract negotiations. The Company had refused the day off, but the employees took the day anyway. The workers of the plant held a strike for the full month of February 1978 over pay increases, in-company transfers, and seniority considerations. Admiral was considering shutting down the plant even then. All of the tension and uncertainty culminated in the announcement in mid-March of 1980 that Canadian Admiral was closing Beach Foundry, and moving operations to Montmagmy, Quebec. This news was not well received at Beach, nor in Ottawa as a whole. Reasons for the closure were unclear. The company attributed the closure to the antiquated condition of the plant, and also blamed the City of Ottawa for restricting its ability to expand. 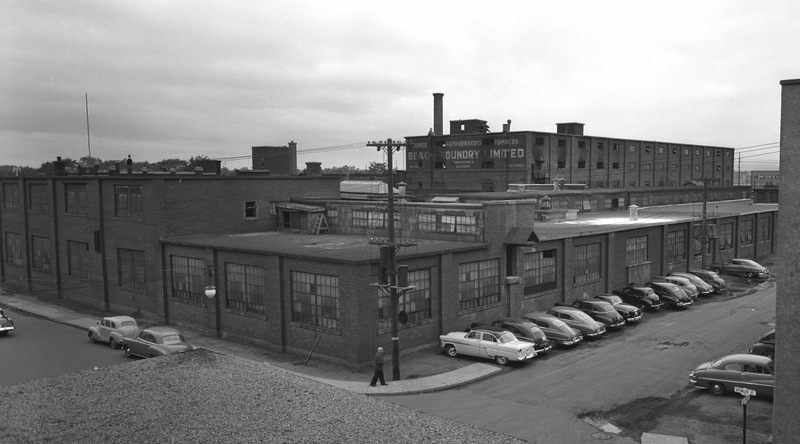 Insiders argued that the plant in Montmagmy was just as antiquated, and Ottawa Mayor Marion Dewar noted that Beach Foundry nor Canadian Admiral had applied for any building permits since 1956, and that in fact the City was supportive of growing light industry in the area, and likely would have approved any application, which would have required a simple spot rezoning. Perhaps the most likely reason for the move, reported through Montreal newspapers, was an apparent business deal with provincial government funding the a Montreal holding company to assist in supporting the $40 million purchase of Canadian Admiral by York-Lambton Ltd. It was also later reveal that the federal government was chipping in $380,000 to Admiral towards the expansion in Montmagmy. This after the company had apparently been seeking federal funding for years towards renovation/updating of the Ottawa plant, but only received it once the move to Quebec was confirmed. On Tuesday August 26th, 1980, the workers of the foundry staged a sitdown to protest the lack of severance pay for some of its long-time senior workers. Most were faced with the likelihood that when the plant closed in October that they would leave with no pension, no severance whatsoever. The Citizen interviewed 45-year employee Corky Smith who had spent his entire life in the plant (and also his father before him) and believed he may not get anything after the shutdown. Thankfully, the workers were able to negotiate an acceptable severance settlement for the long-time workers. A report in the Journal in October of 1980 told one more sad story, of a widow whose husband Marcel Seguin, a 40-year dedicated employee of the plant had died in September after falling ill at work. The company refused to pay the $10,000 severance owed to him, as he had died prior to the November 1st severance date. His story reads like a grand symbol of the blue-collar worker that defined Beach: joining the company at the age of 20, working long hours 35 years as an electrician, then on the assembly line since 1975 without taking a single sick day. He had his kneecap replaced by a steel plate after an accident at the plant, and had lost a thumb when nearly electrocuted by a stove he was fixing. He fell ill at work in August of 1980, and came home with stomach pains and a high fever. He fell into a coma a week later, which he remained in for weeks. He woke up in a delirious state shortly before he died, asking his wife Gabrielle "to hurry and get his pants as he had to get back to work." His final words even were of Beach Foundry. Unfortunately, the closure could not be stopped, and the 275 employees of the plant were out of work on October 31st, 1980 when the plant closed its doors for the final time. 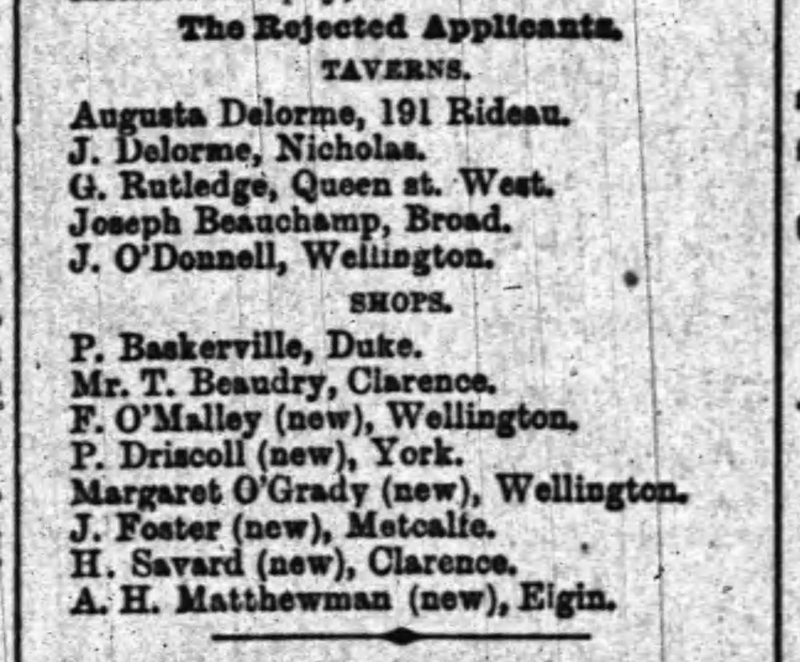 There were reports that jobs in Montmagmy would be offered to some of the Ottawa workers, but it was doubtful if any would accept (and I am unable to confirm if any were even offered in the end). The affect on the local community was significant. This part of west Ottawa had been an industrial focal point for 70 years. Paul, whose father was directly affected by it added: "Yes, I think the closure had a big impact on the neighbourhood in terms of direct employment and business activity around the plant area. That whole block with the Beach, Capital Wire, Sperry Gyroscope was the industrial employment hub for Hintonburg. The employees just lost their jobs and as a pension plan had only just recently been made available to employees, they left with close to nothing. My father foresaw that the closure was inevitable and after 28 years left in early 1979 and moved to Toronto to try to find employment in his line of work. He moved around 5 or 6 jobs in Toronto and Brockville over the next 10 years, coming back to the Ottawa area in 1988. " The demolishing of the property took place in 1981. 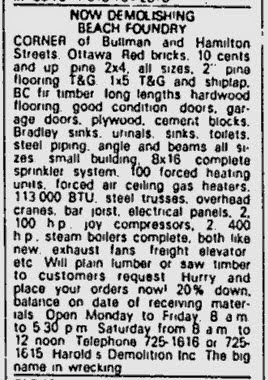 I even found a little classified ad placed by the wreckers who were offering for sale all the components of the great Beach Foundry. The first phase of Holland Cross was built in its place in 1986. 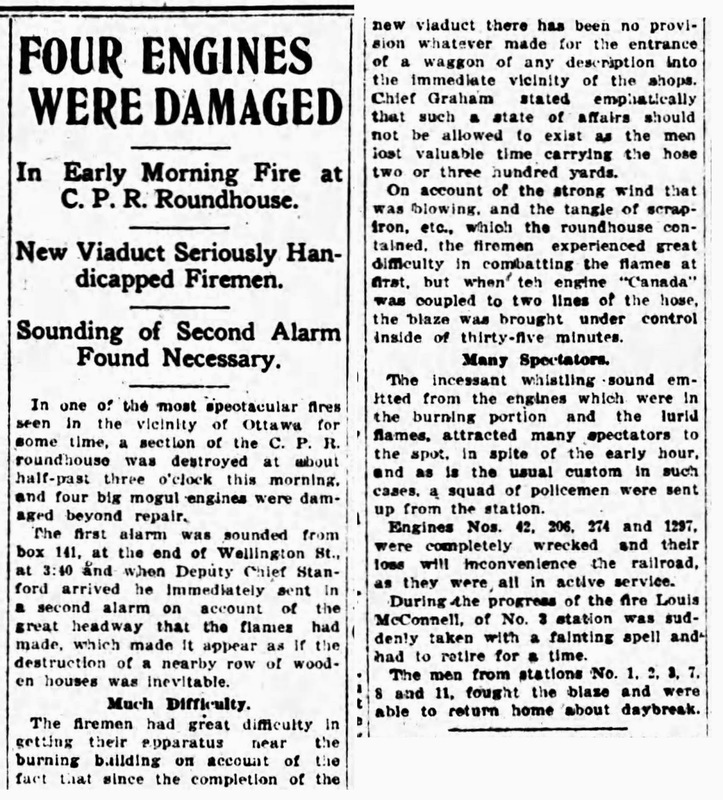 No doubt, the Beach Foundry was an important part of west Ottawa, and particularly Hintonburg and Mechanicsville for many, many years. Rarely have I done one of my house history projects for a client where at least one former occupant of a home in the area did not work at Beach. 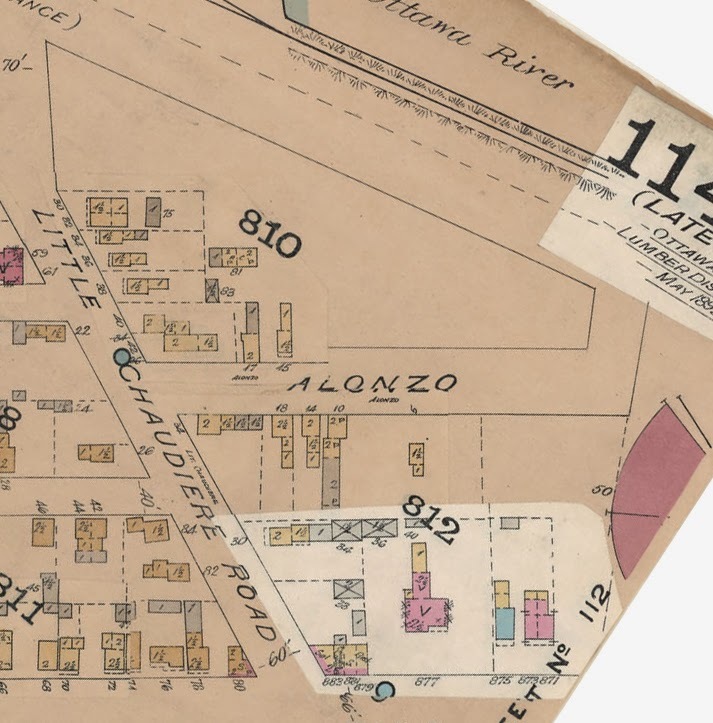 In researching for this article, I put up a posting on a great Facebook group dedicated to all things Mechanicsville, looking to find someone who had worked there. Within minutes, several readers had replied listing off family who had worked there, and over the next few days many more chimed in noting that their dad, or grandfather, and/or brothers had worked there as well. It was an institution in Kitchissippi, and sadly another proud part of the history of our community that has been lost. 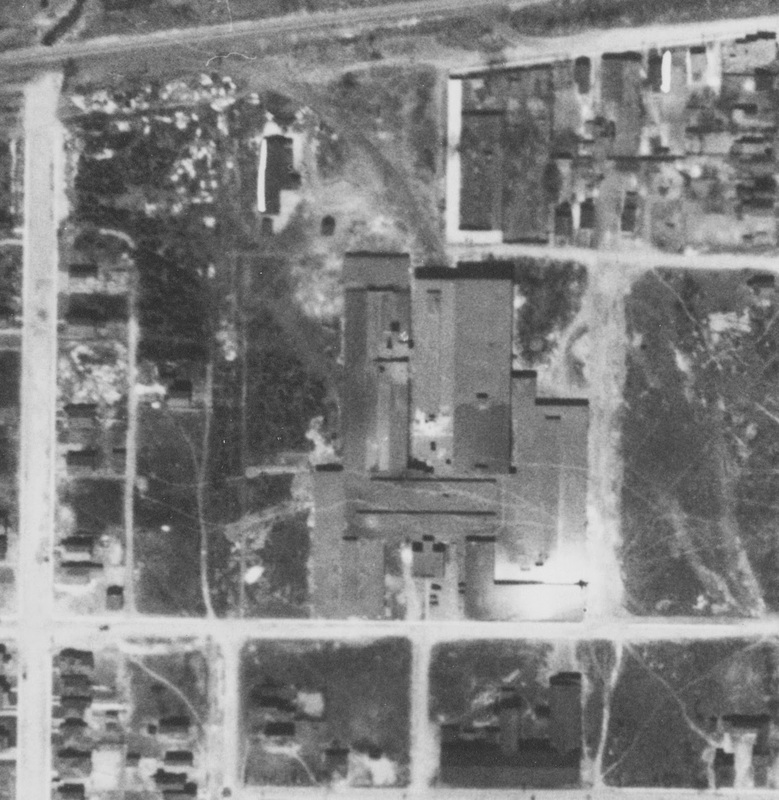 1979 aerial view of the foundry in its final days. I am indebted to Paul Johanis for his contributions to this article (and for adding to my growing knowledge of the Beach Foundry). Thanks so much Paul! You should also check out Paul Johanis's web page on his time at the Foundry at http://www.jonesey101.com/blog/working_at_the_beach_foundry/).